For frequent flyers who want a little more on top of the usual benefits that come with flying Southwest, the new Southwest Rapid Rewards Priority Credit Card has a lot to offer – a $75 annual travel credit, a 20-percent discount on Southwest purchases, four free Upgraded Boardings each year. The card, which charges a $149 annual fee (not waived in the first year), is essentially Southwest’s version of an elite credit card. It doesn’t offer quite the breadth of benefits that you would expect from a card with such a large fee. However, the Rapid Rewards Priority card offers just the right benefits to make it the best choice of any Southwest credit card. The Southwest Priority card offers 40,000 points for signing up for the card and spending $1,000 in the first three months. This matches the sign-up offers on many competing airline cards, but at least the spending threshold is very low to receive the bonus. And it’s a fairly valuable offer – worth around $640 in Southwest airfare. The Southwest card also offers a bonus of 7,500 points each year on your card anniversary. Worth around $120 in airfare, the bonus compensates for most of the card’s $149 annual fee. One of the best things about the Southwest Rapid Rewards program is that the points are simple to redeem. Points don’t expire, there are no blackout dates or limits on rewards seats – if a seat is available on a flight, you can book it using Rapid Rewards points. Also, the value of rewards seats is very straightforward. Southwest breaks its fares into three categories – Wanna Get Away fares, Anytime fares and Business Select fares. The value of points for these three types of fares is very consistent – around 1.6 cents per point for Wanna Get Away fares, 1.1 cents per point for Anytime fares and 0.9 cents per point for Business Select fares. The strategy for redeeming points is simple – if you want to get the best value, you’ll almost always want to book a Wanna Get Away fare (and you’ll want to do so in advance, before the seats disappear). On the downside, since the number of points required is linked so closely to the fares and the pricing is very consistent, there’s little you can do to maximize the value of your points. You’ll almost always get 1.6 cent per each Rapid Rewards point if you redeem points for Wanna Get Away fares. One major drawback of the Rapid Rewards Priority credit card is the relatively small size of its airline network. Its international footprint is extremely limited – outside of the U.S., it only offers flights to the Caribbean, Mexico and Costa Rica. However, for cardholders who prefer to fly domestically, Southwest Airlines does offer good coverage coast-to-coast. $75 annual travel credit – You get a $75 credit each year to use toward airfare, baggage fees and other miscellaneous fees. This is much more valuable than the typical travel credit that only counts toward incidentals. In fact, we’ve added it into the annual rewards value, because it basically functions as an additional bonus toward free airfare. 4 Upgraded Boardings per year – Depending on availability, you get four free upgrades into the A1-A15 boarding group each year. Though not as valuable as unlimited preferred status that comes with some airline cards, it’s a nice perk to have if you love to be in front of the line on Southwest. 20-percent discount on in-flight purchases – You get a 20-percent discount on in-flight purchases with the card, including drinks, Wi-Fi, messaging and movies. 2 free checked bags – You get two free checked bags on every Southwest flight. Actually, this isn’t a card perk – every passenger on Southwest is entitled to free checked bags – but, since most airline cards tout free checked bags as a feature, we would note that this perk is automatically granted to all Southwest passengers, including your flying companions, whether or not they’re on the same reservation as you. No foreign transaction fees – The card doesn’t charge a foreign transaction fee for purchases made outside the U.S., including online purchases (most cards charge between a 2 to 3 percent fee for foreign transactions). Is the Southwest Rapid Rewards Priority card worth it? For the first year, the Southwest Rapid Rewards Priority card is almost certainly worth a $149 annual fee. The value of its sign-up bonus and the $75 travel credit more than make up for the annual fee. 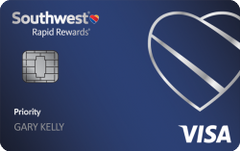 For loyal Southwest flyers, the Southwest Rapid Rewards Priority card also offers the best value in the long run. While the card charges $50 more per year than the Southwest Rapid Rewards Premier card, its annual bonus and $75 travel credit still easily cancel out the difference in fees. As long as you make purchases and redeem points frequently enough to take advantage of the annual bonus and travel credit, you’ll get $124 more value with the Priority card than the Premier card. On top of that, you get four Upgraded Boardings and a 20-percent in-flight discount each year. Why get the Southwest Rapid Rewards Priority card? You want to cash in on sign-up bonus. You’re a frequent Southwest flyer who can use the card’s benefits including Upgraded Boardings and discount on in-flight purchases. You prefer to fly domestically rather than overseas. You prefer a simple airline rewards program to a more complicated one that allows you to get extra value out of your points. You want the best Southwest Airlines card. Be sure to spend $1,000 on the card in the first three months to earn the sign-up bonus. Make all your Southwest purchases with the card to take advantage of the bonus earnings, $75 travel credit and 20-percent discount on in-flight items.